A mother and her teenage kids, the son close to 20, the daughter maybe 15, are having a hearty breakfast of olives and yogurt with raisins. The son's innocuous outfit – jeans, polo shirt and sneakers – permits no inferences concerning his cultural background. The mom and daughter contrast strikingly with their heads carefully wrapped in tenebrous scarves and their bodies in heavy grey coats that wouldn't be out of place in a street café in wintry Anchorage. Curiously, it isn't in Alaska but in Turkey, in a hotel in Istanbul, that this scene is unfolding. The contrast between the women's ostentatious religiousness and the boy's Western ordinariness couldn't be any greater and holds the key to understanding Istanbul. Pairs of opposites combine to create this city, an intimate side-by-side of discordant worlds where Occident meets Orient, tradition contrasts with the modern, devout with perfunctory Muslims, rich with poor, Europe with Asia, and day with night. These parallel worlds don't collide that often, but there is hardly any invigorating friction either. Instead they seem to coexist in mutual ignorance for the most part. It was in this three-dimensional puzzle of a city where one piece doesn't fit its neighbor, and yet the sum forms an intact structure, that Michael, a friend from high school, and I spent seven charged days towards the end of March of 2006. Since Michael lives in Germany and I in France, we hatched our plans over the phone and internet. The Friday afternoon our vacation started we finally met in person at Atatürk International Airport, effortlessly running into each other as if fate were guiding us. From there, a subway and then a tram took us into the historic center of town where our hotel was situated. As any other tourist arriving at Atatürk, we entered the city through a breach in the old Theodosian wall exactly where, in 1453, thousands of pillaging Ottomans stormed Constantinople when Mehmet II finally took control of what sad little fragments remained of the Eastern Roman Empire. While we hadn't come to plunder the city we were certainly ready to conquer it as best as possible in one short week. I had booked our hotel on the internet, without spending too much time finding the best deal around. Nevertheless, it was one of the cheaper rooms available from an obscure website targeted to the budget traveler. After charging my credit card in full, a file was provided for me print and present at the reception desk upon arrival. The hotel was the Erboy, and I was mildly skeptical. Spending little and saving a lot is only a small step from spending little and wasting all. To make a long story short, the hotel was great. My crumpled printout covered our entire stay with not an eyebrow raised nor a question asked. The staff were friendly and, Saturday morning at four when we returned from our last night out, outright hilarious. Our small room was quiet, clean and comfortable. Breakfast was the same every morning but so delicious that I didn't mind. None the least, we were most centrally located. Within a five minute radius were the Haghia Sophia, the Topkapı palace, the terminal for Bosporus ferries and boats, the Egyptian bazaar, the (unpronounceable) Cağaoğlu hammam, and a handful of other sites. The hotel couldn't have possibly been any better. The auspicious geography of Istanbul was recognized before there were any Turks around. Situated between worlds where Europe and Asia meet, at the crossroads of important trade routes from the Black to the Mediterranean Sea, from Greece to Asia Minor, the city has been in an enviable and envied position since it was founded by the Greeks as Thrace in the seventh century BC. Merchants, mercenaries and migrants from all over the known world were drawn by its allure and added their little contribution. In the year 330, after the Roman Empire had split in two, Constantine I declared Byzantium, the successor to Thrace, the capital of the eastern half of the Empire. It became known as his city, Constantinople, and acquired its present name only in 1923. Safeguarded on three sides by water (Bosporus, Sea of Marmara, and Golden Horn) and soon protected on the forth by a gigantic system of walls, moats and lookouts, started by Theodosius I, it promised safety to its inhabitants and power to its rulers. What's more, the Golden Horn, a shallow estuary formed by several rivers, is a perfect natural harbor and whoever controlled it automatically dominated Bosporus trade and traffic. The Golden Horn itself was insulated from enemy forces by an iron chain kept afloat by buoys and anchored on both shores. It could be lowered to permit naval traffic and raised to prevent any incursion. 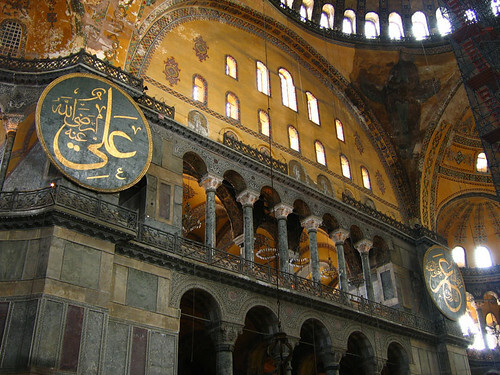 Thus shielded, the city of Constantinople lasted longer than most empires. It withstood for more than a millennium all attacks by Mongols and Turkmen, by Arabs and Greeks and was, for long centuries, the largest, richest and most magnificent of all European cities. Left and right of the mouth of the Horn, where once the iron chain was anchored, are now the pillars of Galata bridge. Ships can still drive up the Horn because of an intricate opening mechanism that temporarily breaks tram tracks and power lines. We didn't know about this on our first evening when we crossed it for the first time. It was late already but it was Friday, and we were on vacation. What were we supposed to do, sit in our hotel room watching Turkish CNN? No, we took a taxi across the bridge and up to Taksim square, the center of the Beyoğlu neighborhood and hub of the city's nightlife. We were very afraid of being ripped off or taken to an undisclosed location. Every thirty seconds we reminded our driver that we wanted to go to Taskim and asked him if was sure he was going in the right direction. This one was, and he did. Our first ride up to Taksim ended up the quickest and cheapest of our stay. We were released when the taxi came to a stop in a long line of other taxis. Around us people, thousands of them. We joined the crowd walking about aimlessly and enjoyed the warm night. I found myself soon talking to a stranger, discussing the merits of Ballack and Kahn (who at this time was still number one). Michael was staring straight ahead being deliberately absent from the schmoozing. He had read enough guide books to know that my new friend was a tout. His job was to get me into a night club where I would be charged several hundred euros for a beer. He lived off the cut from the club. I was so absorbed in the conversation that I only bailed at the last moment. This guy almost got me. Michael was shaking his head in disbelief. Hearing that the person you find yourself talking to, seemingly serendipitously, has lived in Germany, knows German, likes you, and wants to make you feel good is very stimulating at first. This is obviously the idea. The gullible stranger is made defenseless by professed friendliness. The same story sounds stale the second day, though, and by day three it is only annoying. So annoying in fact that during an Efes-induced burst of creativity we devised an ingenious counter-strategy for avoiding carbon copy conversations. The next time someone would approach us on the street, we schemed, we would ask him, even before he could pose his inevitable question, where he was from. The expected answer, Istanbul, would trigger a jovial, ah, my dad worked here for four weeks, which was even true. Then we would tell him how excited we were to have met him and how much we would appreciate spending a few hours in his company, and if he wouldn't mind coming with us to this little cafe we knew where we could have tea and chat. This mindless babbling would need to be sustained until the person bolted for lack of potential financial gain because we were surely not going to a club that he worked for. Thus prepared we were ready to face and stare down the next tout but, as things sometimes happen, we weren't approached again. But this stratagem hadn't seen the light of day yet. It was still the first night, getting later with each uncertain step in unfamiliar and somewhat uninviting surroundings. After a good two hours in what was described in all guides as Istanbul's hottest neighborhood, we had not even found one bar we wanted to enter. Slowly running out of enthusiasm, we entered a side street that we had ignored during our repeated promenades up and down Istiklal. One step from the main drag, we were in a different world. Delightful, powerful, joyful music came from a window up on the first floor of a building to our left. The building could have been any old building. Nothing set it apart from dozens of similar edifices around it. Nothing, that is, besides the music. Not having our ears stuffed with wax that kept Odysseus's sailors focused, we entered and climbed the stairs, entranced as if the Sirens themselves were calling. Pleasure was welling up inside us. We had finally arrived. We were wrong. Between us and the sweet sound of Turkish fusion music remained one last obstacle, unsurmountable, a solid hardwood barrier that would not open for us. 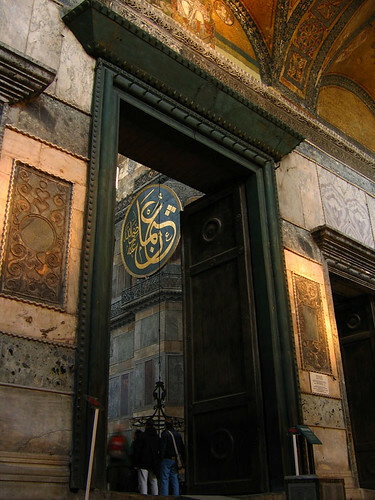 The keeper of the gate was installed motionless in front of the door and kept it firmly shut. He smiled at us and expressly waved his hands over the crowd inside that was briefly visible when the door opened to let some guests out. The place was full, the gesture wanted to say. Either this, or we weren't welcome. Stunned, almost stupefied at first, we turned around and stumbled back down and out. Suddenly, our mood lit up in an explosion of joy. For the first time that night we had not been waylaid in an attempt to drag us through a door against our will. Those who send you away have clearly no plan to rip you off. We decided we were in the right area and approached, with optimism and excitement, the bar two doors down where music very similar to what we had just been sent away from was playing. A repeat of the same sad story didn't faze us in the least. Maybe the music is so good that all bars are full, we were thinking. Maybe indeed, because the bouncer at the next door down made a serious attempt of discouraging us as well. A look through the window convinced us that guests were about to leave. We declared our intent to sit it out, battled the sudden reappearance of touts, and found ourselves, a short three minutes later, inside Cafe Munzur, and our vacation started in earnest. 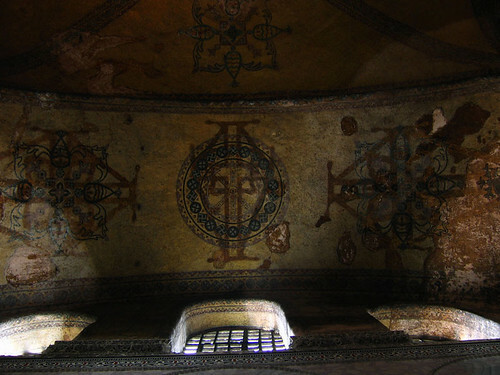 This small hang-out was full of Turks – there was not one tourist in sight. We ordered beer and received three bowls of free treats with it. A trio consisting of a saz player/singer, a female singer and a rhythm guy entertained us for close to three hours with their music. They played traditional tunes according the whims of the audience. Guests wrote names of songs on napkins and stuffed them into a box next to the microphone. At the end of a song, the next napkin would be fished from the box and the show continued. At the end of one set, waiters picked up huge drums, the crowd stamped their feet and a wild surge led into a well-deserved break. Fifteen minutes later, the next set started. High energy was vibrating in the small club, and hardly anyone left while we were there. We consumed Efes and peanuts galore, bobbed with the music and ended up having with our neighbors what can't possibly be called conversations. To our left was a drunk guy and his friends and to our right two girls. None of them spoke anything but Turkish, but all were very interested in exchanging strange-sounding words with us. It was close to three when we finally took a cab back to the hotel. The little yellow box was going full speed on nocturnally deserted streets, but the ride took twice as long as our way up, and we paid three times as much. This unexpected tour around town led us to devise strategies to recognize honest people. My initial hypothesis had been to pick the least glamorous offering, an old restaurant or the most decrepit of taxis, on the notion that those who are honest and only take the money that's due have no means for fanciness. I had already been proven wrong on our first commercial venture, leaving the hotel earlier that night in search of dinner. We had entered a hole-in-the-wall cantina and ate most of what was on the menu, all exceedingly delicious dishes. In the end we paid more than twice the added value of said menu. And the owner waved us good-bye with a big smile. Next it was up to Michael to propose his theory. Always entrust yourself to old people, he mused. The young have their life ahead of them, are cut-throat ambitious, want to make it big, and take your money where they can. The old have mellowed down and are content with their lives. This sounded reasonable enough, except it didn't explain our profligate first dinner. Another theory was needed. I came thus up with a third hypothesis arguing that capitalism has fully arrived in Istanbul, and what we saw was free market in action. According to theory, the market rewards those with the best product at the best price. People take note and come back or spread the word. The merchants earn money, and their business florishes. From day two on, we only picked shiny new taxis. We were indeed spared any further disasters, and Adam Smith smiled contentedly through the window. Aside from taxis and restaurants, there are plenty more opportunities to contemplate market forces in Istanbul. Among the best are at bazaars, most notably the Grand Bazaar. The Grand Bazaar is the largest covered market in Istanbul and, by extension, in Turkey. What appears at first to be merely a maze of little stalls and booths that sell anything the heart might desire is in fact a mercantile city within the city, complete with post office, tea houses, hammams, and a mosque. Some probably live there. Despite being decried by travel guides as chaotic and supremely confusing, I found it fairly organized and easy to navigate. Classes of products are sold in their dedicated areas (gold avenue, leather section, perfume alley), the entire structure is well lit, and passages are broad and straight. No comparison with souks in Tunisia where getting lost is considerably more likely. To me, the most fascinating part of the Bazaar was the fashion section. Ronaldinho jerseys, Louis Vuitton handbags and Aldo shoes were competing with Chevignon jackets, Levi's jeans and Lacoste polos. All big names were present, cursorily presented, competitively priced, and criminally fake without fail. Fashion creators and purveyors of luxury goods are quick, intense and persistent in decrying billions of losses each year because of fraudulent imitations. This shameless hypocrisy must not stand unanswered. Is Cartier losing revenue when a Turk buys a fake diamond watch? Or is it rather that the copies aliment desirability? One booth displayed three copies of a mauve lady's t-shirt sporting, respectively, the logos of Nike, Puma and Adidas. It is likely that representatives of these three (and all other major) makers patrol the Bazaar to assure that their brands are as prominently placed as the competition. Where would Adidas be if suddenly only fake Pumas and Nikes were sold? If their logo disappeared from the Bazaar, kids wouldn't wear their shirts to school anymore and wouldn't cause envy and stir desire in their peers. Somewhat dramatically exaggerated, and with sincere apologies to all those creative fellows in the marketing departments, no one would know Adidas existed. The Bazaar provides free advertisement, and ten years from now the country will be full of loyal customers that have grown up with the brand. They will finally be affluent enough to afford the real deal and forgo the fake, which is never more than ersatz. Neither Michael nor I were in need of clothes, and both of us ignored the countless merchants pitching their schlock. We spent nevertheless plenty of time at the Bazaar and in various shops because of Michael's mission to find lamps. Against all tradition, he bargained when he wasn't ready to buy, only to warm up and practice the craft. When his time finally came, one early morning right after the little shop he had picked had opened, he stood his man and walked away, an hour and some broken glass later, with three lamps and the conviction of a good deal. I had sat by and drank tea, while Michael, absorbed in the wheeling and dealing, missed out on this most important of all ingredients of a successful business transaction. Concurrently with Michael's quest for illumination, we explored the historic center of town, a neighborhood named after Sultan Ahmed I, which is filled with a mind-boggling cumulation of buildings and structures, above and below ground, bearing evidence of a glorious past. In their vast majority they are Ottoman. The most notable exception is a construction that puts all others to shame. Without it, Istanbul would not be the same; with it as the only attraction, the city would still be worth a visit. This edifice is the Haghia Sofia, a piece of art so stupefyingly splendid that a visitor's mind hardly accepts what the eyes see. Trying to describe it, I find that my hand is too feeble to do it justice. The Church of Holy Wisdom was built as an Eastern Orthodox church in 537 by the order and under direct supervision of emperor Justinian I. The magnificent central dome, delicately balanced on pillars of light, it seems, collapsed during an earthquake about 20 years after its initial erection. It had to be rebuilt a good 20 meters higher in order to distribute the immense forces more sensibly. After this early modification, the building has stood to this day, calmly approaching 1500 years. As soon as we passed through the first door and entered the narthex with its marbled floor, decorated walls and painted cross vault, we were in awe. Peeking through the massive thirty-foot-tall entry portal, we got a first glimpse of the splendor inside and ventured, thirty minutes and as many pictures later, into the nave. There, we spent several hours, mostly stunned and silenced. After exhausting our capabilities of comprehending and grasping what we saw on the ground level, we move up to the gallery. By that time, a large group of school children, chatty despite the best efforts of the teachers, had entered the basilica. Belying my worst fears, the noise that arose was not in the least obnoxious. The church took the jabber naturally, like a large earthen bowl being slowly filled with water. In a long crescendo, imperceptible at first but soon substantial, quiet murmur turned into powerful resonance. Obscure harmonics, memories of long-forgotten songs, started to resound from the walls. With every breath we took, admiring by now Greek mosaics and ancient wood carvings, the bowl filled further. 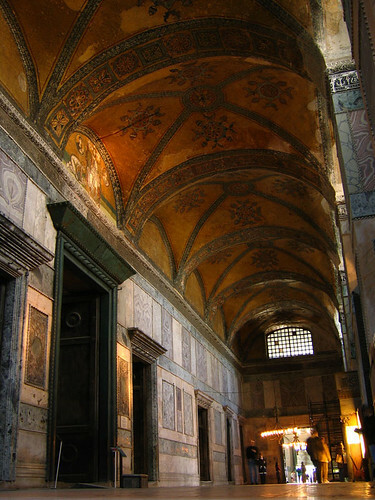 Haghia Sophia became replete with dense reverberations infinitely broken on the countless corners, edges and pillars, acoustically mirroring the light falling in through dozens of stained-glass windows, narrow beams painting warm patterns of ochre, sienna and tan. At the same time outside, urban life raged on. With somewhere between 15 and 20 million inhabitants, Istanbul is the biggest city of Europe, and it's growing daily. Seen from the first Bosporus bridge, some 60 meters above the water, the infinite expanse of urban sprawl is staggering. Millions of small cubes in various shades of grey, thrown together haphazardly, represent the ordered face of the city, buildings overwhelmingly erected conforming to code, or at least not in complete disregard of it. The other face, invisible to all but the most daring visitors, are the gecekondus, settlements hastily put up in the middle of the night. In the middle of one night, to be precise, for according to traditional law, any structure capped by a roof is immune from demolition, irrespective of where it's built and by whom. And every day new migrants arrive from the east, from rural impoverished Anatolia, in search of prosperity and streets paved with gold. And every evening they set out to build their home, and when the sun rises the next morning they are done. And from that day on, they lead a miserable life in the big city, having left behind a miserable life in a small village. The city keeps growing and is always on the move. It exudes an aura of business in the true sense of the word. People are running around, everyone is going somewhere, the city never sleeps. At the many bus terminals, meeting points of dozens of lines each, uncountable buses are waiting to take passengers all over town, with old Ikaruses and newer Turkish-made varieties coming and going more frequently than the Paris metro. Yellow cabs, mostly Tofaşes, Turkish-made Fiat clones, add to the sensation of chaos. They are everywhere, but most prominently present when buses are not, like in the middle of the night at Taksim square where a circle of cabs surrounds the Atatürk monument. They form a quasi-permanent collar with each element staying for short moments only until a nightbird catches a ride and the leaving yellow dot is immediately replace by another. Istanbul is the first city I have been to where I would be afraid to ride my bike. Traffic is crazy beyond comprehension and as dense as can be. This is at a time when driving is largely restricted to the nouveaux riches while most take buses and dolmuşes, the ubiquitous minibuses. The authorities seem to have recognized that the city faces death by suffocation if public transport is not developed fast and with great ambition. The tram line is being extended to Besiktas, a new metro line is being built, and gigantic tunnels for more metros are under consideration underneath the Bosporus. Coming from smaller cities, from conurbations of less than a million, Michael and I were soon tired of the noise, dust, and pollution that permeate the megapolis, and of constantly elbowing through crowds. We needed to get out. Istanbul makes this easy. Boats heading to the Marmara Sea at one end of the city and down the Bosporus straight to the Black Sea at the other leave frequently from Eminönü, only five minutes from our hotel. It was one of these boats that we hopped onto the morning of what turned out to be the most beautiful day of our trip. Two hours of peaceful cruising, underneath two impressive suspension bridges and along ancient fortifications and posh waterfront residences, took us to Sariyer, the last stop before the Black Sea. Off the boat, we weren't quite sure what to do. Having come on a friend's suggestion, we had neither plan nor expectations, only the desire to escape the noisome air of the big city. Tempted by ruins high up on a hill, we climbed a narrow path that took us to the front yard of a house set precariously on the slope above town. The trail we were following suddenly ended, and one of those special moments that make traveling rewarding began. The owner of the house was planting trees and, upon seeing us, decided to take a break and invite us into his house and at his dining table. His wife, with a warm smile, prepared tea, dished up olives, cheese and bread, and took her place on the sofa. The grand-daughter, rather cold at first and certainly doubting the old man's sanity, served tea and kept her distance. 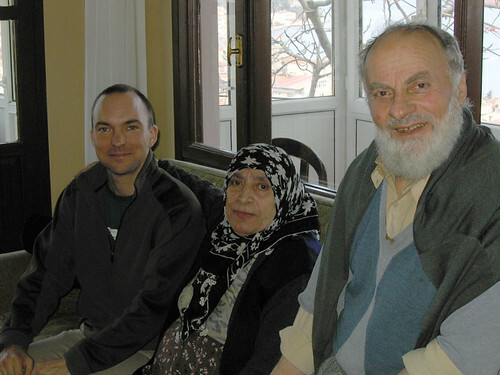 Ali Osman, as he introduced himself, ate and drank with us and regaled us with stories of his family (the joy of his old age), the hajj he took a few years back, and the time he had spent near Köln in the 1950s, from which he keeps dear memories and fine language skills. He laughed a lot and filled the entire house with his exuberance. In the end, even his grand-daughter smiled at us. Michael and I speak no Turkish. In fact, this trip marked the first time I arrived in a foreign country without even the most basic notion of the language. I didn't know how to say hello or please or thank you. I didn't have a guide book. I had no clue. Now I feel that was some sort of blessing in disguise. I had to rely entirely on what I heard, and I think once I figured out what certain words meant I could pronounce them close to the original. As in every country except France, one word or two in the local language automatically endears one to the natives. In Istanbul, a friendly merhaba gets one far, and an iki Efes even farther. Teşekkülar. As it turns out, the Turkish language offers countless moments of joy for the linguistically inclined. Germans usually get fraternal feelings seeing the many ös and üs, but it is in fact spoken French that the umlauts derive from. Üniversite is pronounced identically in France and Turkey, ditto süper, kültür and, curiously, kuaför. It was the latter, the common barber, that I got intrigued with during our stay. Barber shops were everywhere and men get their hair cut and faces shaven at all times of the day and even as late as ten at night. For my undemanding head, this would have been a great opportunity to get professional attention. But as it was, our vacation was filled to the brim already and, as for so many other things, there was no time. Luckily, there was enough time for Zeynep and Deniz, two friends we met in Istanbul, to show us around, take us to bars, karaoke, and restaurants with Turkish delicacies that no tourist would find. On our last afternoon, the four of us went over to the Asian side, to Kadıköy. After tea in a clear plastic tent overlooking the Marmara Sea, we walked by Ali Usta's without knowing and briefly discussed getting ice cream. It was so cold that we opted for hot salep instead and thus narrowly missed the fox testicle ice cream that I had been secretly looking forward to. By the time we got back to the wharf, after all the eating, drinking and chatting, all was quiet, and the last boat for Europe had long left. That wasn't a problem at all. A dolmuş was waiting, eager to take us to Taksim where the night would continue. Thirty minutes later, lights and noise surrounded us once again. We listened to music, converted lira to drinks, hung out like we had known each other for years, and time flew by. Twelve hours later we were both back in our respective homes, our heads spinning from a week without rest, ready for a vacation. Istanbul is a jumbled mess, a staccato of sensations, each new and unexpected. It can't be explained but must be experienced. The breakfast room of your hotel might be the best place to start. Make sure to get olives and yogurt with raisins.